We probably all spend a considerable amount of time and effort researching what home studio equipment to buy. Monitors are an obvious example, as even the briefest trawl through the SOS forums quickly reveals. But after spending a small fortune on monitors, who gives an equal amount of thought to how to support those expensive new speakers? It is an inescapable fact that the loudspeaker stand can affect the performance of the speaker quite dramatically — but only in a bad way. If the speaker is not supported correctly, it cannot deliver the intended performance and, if the stand is not designed and used correctly, it can generate noises of its own, that mask or interfere with the wanted sound from the speaker. Towersonic are a new British company offering a range of four professional speaker stands, available singly, in pairs, or in 5.1 sets. The unusual feature of these attractive designs is that they are height adjustable, and for many that is a very welcome facility. Their stands all comprise steel base and top plates, each bolted to 130mm-diameter steel tubes, with aircraft-grade anti-shake washers that ensure a reliable and secure fitting. The upper steel tube has a slightly larger diameter than the lower one, and slides over it with an interference fit to provide the adjustable height. The tolerances are so tight that lifting the upper tube quickly creates a vacuum sufficient to lift the base off the floor! The upper tube is locked in place with a pair of large thumb-screws at the rear, although an optional stainless steel worm-drive hose clip can be used for extra security. This is clamped around the lower (inner) tube to provide an additional load-bearer for the sliding outer tube. The tubes are hollow, but can be filled with dry sand, (unused) kitty-litter or even lead shot, to provide additional mass and damping. A lightweight option is to stuff the tubes with high-density rockwool, which damps the inherent tube resonances very well — or even to combine rockwool in the upper tube with sand in the lower one, which makes it easier to adjust the stand height once filled. The standard height adjustment range is from 800 to 1450mm, although there is a shorter option for domestic hi-fi applications (TS1 HF spanning 470 to 810mm) and taller tubes are available by special order. The two smaller Towersonic stands, intended for near- and mid-field monitors, have triangular foot plates, which are secured to the tube with a single central bolt and anti-shake washer. The TS1 foot plate is specified as 550mm each side, while the TS1B's is 650mm. Larger still, the TS2 model has a rectangular plate, measuring 800 x 600mm, and the current range-topper is the very heavy duty TS3, which shares the same rectangular foot plate, but has twin vertical columns. Metal floor spikes are supplied as standard for all foot plates, but alternative cost options include rubber wheel castors (with locking brakes) or impressive acoustic rubber cones. The rectangular top plate that supports the speaker is fitted to the top of the outer tube with a single bolt and an anti-shake washer. The standard top plate size is 220 x 300 mm. An odd aspect of the design is that the top bolt is dome-headed rather than countersunk, and consequently sits proud of the top plate. To prevent it from fouling on the bottom of the speaker, high-density foam pads are positioned near each corner of the plate, and these also provide some useful decoupling between speaker and stand Apparently, there is also an interesting alternative top bracket option, designed to support three LCD computer screens via standard VESA fittings. After examining the full range, I selected the smallest TS1 model to support a pair of PMC TB2 monitors (with Bryston power packs fitted on their rear panels). Despite the single bolts holding the top and bottom plates to the tubes, the stands are actually very solid, with no rattles or wobbles. The empty tubes naturally ring a little if knocked, but stuffing with rockwool resolved that completely, and filling the bottom tube with dry sand made everything very stable. The height adjustment is straightforward and secure provided the two thumb-screws are tightened carefully. The optional collar provides useful additional security and, if using heavy monitors (the amps on the TB2s make them pretty heavy beasts! ), I would recommend this option. For my interest in location recording, the single bolt, plate fixing and easy height adjustment makes these stands very attractive, because they are compact when dismantled but very quick and easy to assemble. When stuffed with rockwool they remain relatively light to lug around, but are still well damped. For fixed studio installations, these stands represent a good long-term investment, able to accommodate different sized speakers easily while providing a solid and stable support platform with good control of vibration. TS1 (reviewed model) £423; TS1B £505; TS2 £582; TS3 £687; TS4 £1099; TS5 £1287; TS1 HF £441; Rubber cone feet/castors £61 for six; Support collar £35; Prices are per pair (except where stated) and include VAT. For a music book, the title of this one certainly stands out from the crowd, and its approach is equally refreshing. This book is apparently intended to be read in the bathroom, because you can dip in and out of it, digesting small sections at a time. However, if I limited myself to that usage, I'd spend years in the bathroom, as I found I couldn't put it down! Paul D Lehrman is a multi-talented guy: musician, composer, film-maker, music technologist and, most importantly here, a writer. 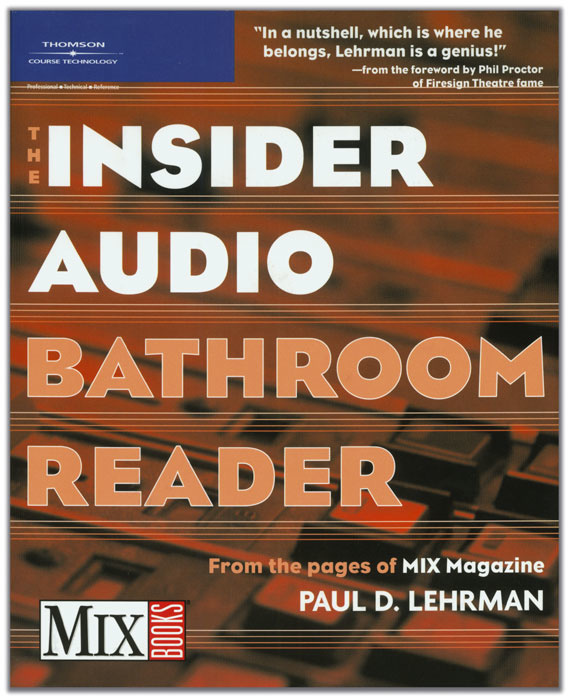 The Insider Audio Bathroom Reader is a collection of a decade's worth of his musings on the industry in the pages of Mix magazine, covering a period of massive change and significant world events. At times you wonder where he's heading, but at the end of each article, you find yourself feeling that little bit more enlightened about music and often life more generally. His style is distinctive and he travels along some delightful tangents. As with the best books, you're not just enjoying the author's opinions but feel as though you're being taken inside his head and are seeing the world from his perspective. There's plenty of humour (including one of the best collections of guitarist/drummer/vocalist/[insert other musician here] jokes I've seen. But it's not all lighthearted: the book is designed both to entertain and to educate, and there are some excellent factual articles exploring issues such as aural health, as well as various practical tips. He also explores many of the big issues facing the music business: the endemic nature of post-modernism in modern pop music, or the 'loudness wars' in mastering, for example. He also takes time out to reflect on 9/11 and other non-audio issues that seemed to touch him personally, such as the passing of Douglas Adams. Dry, satirical and beautifully crafted, this refreshing book reveals Lehrman to be something of a Swift of the audio world and the fruits of his decade's labour form one of the best books I've read in a long time. If you ever feel as though you're being suffocated by a huge, commercial, inaccessible audio industry, this book will soon help you put the world to rights. I can't recommend it highly enough! 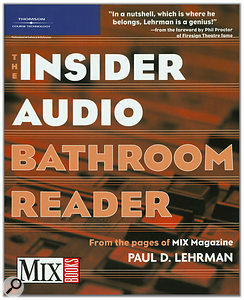 The Insider Audio Bathroom Reader by Paul D Lehrman (ISBN-10: 1598632086 ISBN-13: 978-1598632088), Course Technology, £13.99. +44 (0) 207 067 2500. While there have been numerous books published about the various technical and theoretical elements of recording, very few have addressed the more artistic and craft-based aspects of creating a mix. Understanding And Crafting The Mix: The Art Of Recording (second edition), does just that. Published by Focal Press and written by William Moylan (Chair of the Department of Music at the University of Massachusetts Lowell in America, and an experienced music composer and recording producer), this new edition updates the original in several important ways. Perhaps the most obvious is the reversal of the title, which now places the emphasis more squarely where it belongs, on the mixing stage of the recording process. Secondly, this new edition includes an audio CD with 56 tracks chosen carefully to illustrate the concepts and points made throughout the text, provide practical exercises and serve as the all-important 'ear-training.' The book has also been expanded considerably, particularly in relation to the techniques, practices, skills and art involved in creating mixes, and in dealing with the extra challenge of surround sound. Through its 400 plus pages of fairly dense text, this book starts logically with a section explaining and defining the technical and aesthetic parameters of sound and music. It then moves on to ways of analysing sound and music recordings. The text, in conjunction with the CD, helps the reader to develop and improve critical listening skills — something we all take for granted, but which can definitely benefit from systematic training. Separate chapters cover the evaluation of pitch, loudness, quality and the use of the spatial dimensions in stereo and surround. There is also helpful advice and guidance here on establishing an accurate monitoring system — which is obviously essential in being able to hear the subtle nuances of complex mixes. The third section of the book focuses on crafting a mix, starting with insights into optimising the aesthetics, choosing locations, microphones and other equipment, shaping and then capturing great performances. It then goes on to describe approaches towards editing and mastering. The book is completed with 10 pages describing the CD tracks and 10 pages of glossary. I enjoyed reading Moylan's book, mainly for the way it presents familiar ideas and concepts in a completely new light, but also because it introduced me to new ways of thinking and new approaches to recording and production. The addition of a CD is very useful, and enhances the value of the book considerably — but it also extends the time taken to work through the book, since considerable critical listening time is required to benefit from it properly. Thoroughly recommended. 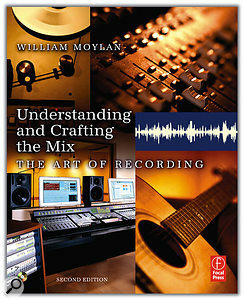 Understanding And Crafting The Mix (second revised edition) by WM Moylan (ISBN-10: 0240807553, ISBN-13: 978-0240807553) Focal Press, £21.99.